A Sallins-based canal vessel has become the first houseboat in Ireland to receive Failte Ireland’s approval as self catering holiday accommodation. The endorsement of the State tourism agency came under the “welcome standard” which recognises the most innovative, unusual and quirky places to stay in Ireland. Since the Róisín Dubh houseboat opened its wheelhouse doors in March, visitors from around the world have stayed on-board, including folk from America, the UK, South Africa as well as Ireland. It is being promoted internationally by Failte Ireland and the owners are expecting 200 visitors a year to choose Sallins as a short stay holiday destination. The Róisín Dubh is the former family home of the bargetrip.ie owners, Ger Loughlin and Carolina Manthei, who lived aboard and traveled the inland waterways with their children for 10 years. Ger hails from Naas and is member of a well known local family. He attended Naas CBS. Brother Brendan operates Brendan's Running Club and has been synonymous with the Naas town 10km event since its inauguration four years ago. The new venture is an extension of the bargetrip.ie business that operates a passenger barge service on the Grand Canal in Sallins that is now taking more than six thousand passengers a year on its Grand Canal cruises. It offers self catering floatel accommodation for up to six people. 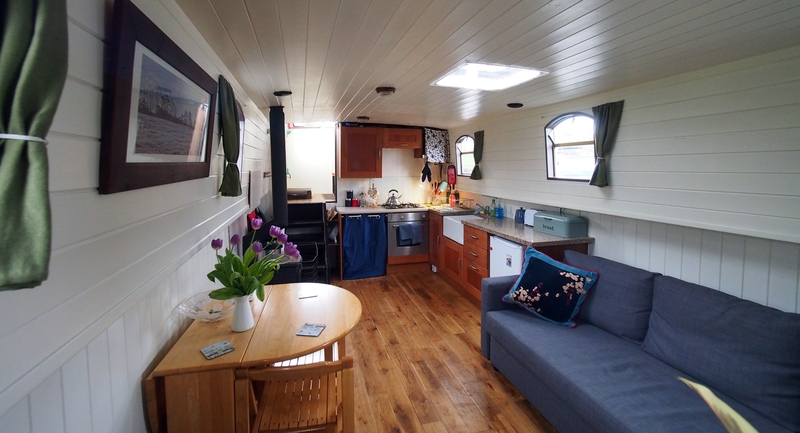 The houseboat was designed for living, feels spacious and is ideal for families, groups of friends and couples looking for a romantic getaway. Sallins is emerging as something of a tourist destination in Co. Kildare. "It was once a busy trading harbour on the Grand Canal where barges began carrying passengers and goods from the small Kildare village in 1780. Today it is home to award winning waterfront restaurants and bars, a large variety of boats, barges and houseboats, a brewery and a passenger barge offering canal cruises in the area," said Ger.